Mormon Wookiee: #4: Nephew and nieces invade the rebel base. This post has nothing to do with being a Mormon, other than the fact that it is being posted by one. However, I figure that not every post needs to be gospel centric. Today and throughout the rest of the weekend, Diane and I get to hang out with our nephew and three nieces (ages 6, 4, 4, and 1.248, respectively). My favorite part of having them here is that my maturity level is right on par with theirs, so we always have a rockin' good time. Tonight we played Jedi vs. Superhero vs. Ghostbuster vs. Disney Princess vs. Killer Ninja Baby. Surprisingly, the Ninja Baby won the fight. Anyway, I sure love these kids. 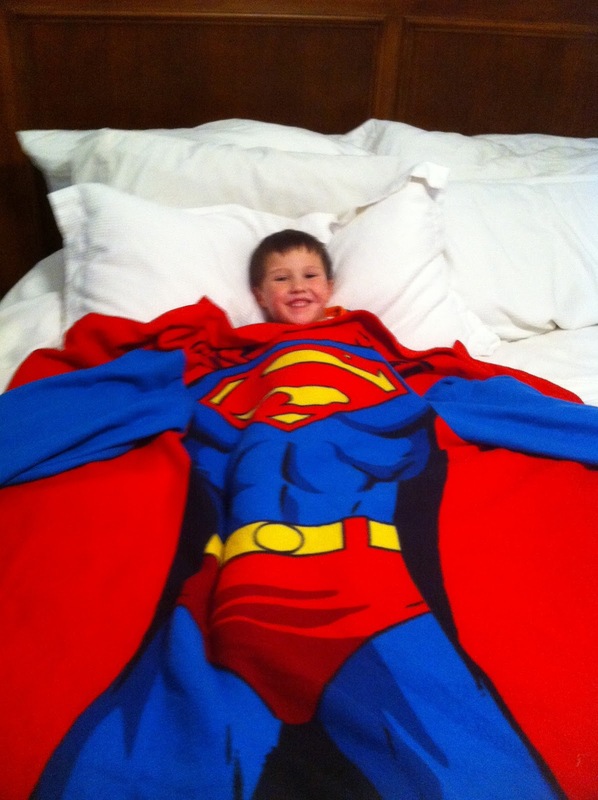 Here is my nephew (the Superhero) snuggling up in bed.